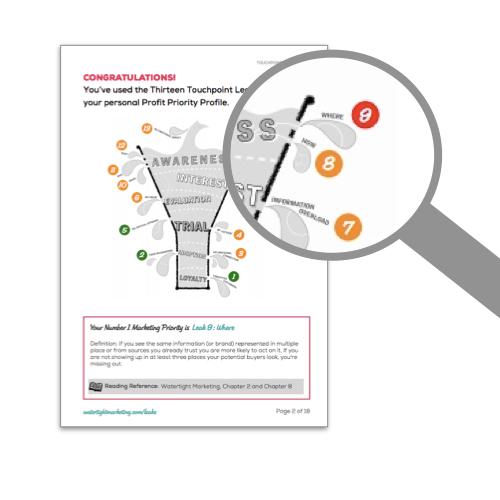 Our unique diagnostic tool that maps your marketing against our Touchpoint Leaks™ framework to show you where to focus your marketing efforts. What’s in your Profit Priority Profile? We’ve developed our online diagnostic tool to profile exactly where in your marketing set-up you should be prioritising your efforts for long-term profits. The first thing you’ll see on your report cover is a percentage score. This is an overall score as to how watertight your overall marketing operation is. 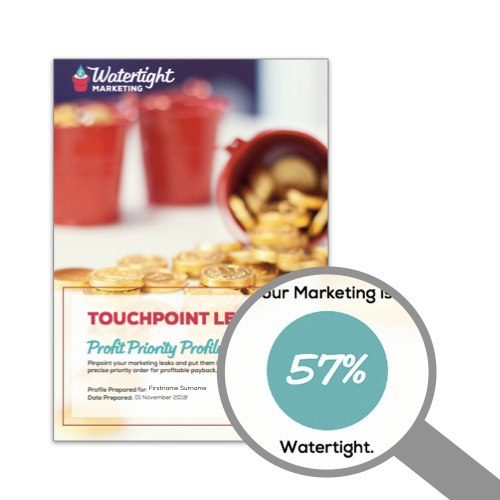 Across all thirteen Touchpoint Leaks, this average gives an indicator how well your marketing covers the whole sales journey. Over time, you’d want to see this score increase. Your answers are used to categorise each of your marketing leaks as Red, Amber or Green according to how close they come to our definition of watertight. This shows you where you have marketing gaps in your sales process through which profitable customer may well be leaking. Your efficiency score and traffic light report show you how large the gap is, and where the gaps are. But, what is particularly powerful in our approach is that we are then able to tell you in what order to address them. 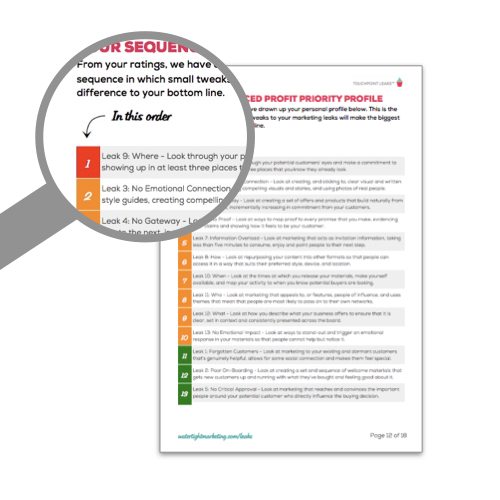 Your report includes a sequenced priority plan for the precise order in which we believe addressing your Touchpoint Leaks™ would deliver the most, and most sustainable, profits. "The Profit Priority Profile is a brilliant way to not only spot gaps but communicate gaps in business and marketing." "I feel that the Profit Priority Profile is the key to the Watertight Marketing approach - the catalyst to actually make things happen, creating clarity and a clear focus in terms of actions and priorities." "This tool was fantastic! It will directly inform the next year's marketing plan and strategy. Exactly what I needed to get focused on the things that are going to make the real difference." Get your report as part of a video-guided course to ensure that get meaningful results, and walks you though how to take action based on the analysis. Book your report directly via one of our Certified Practitioners to have them guide you through it, debrief you on the results, and help you plan your best next steps. If you have 25+ people in your team, we can use the diagnostic to run a deeper cohort analysis, to find the gaps in your marketing, and in the internal perception of it.